The Wood River Community YMCA welcomed more than 400 capital campaign donors to a special event on Friday, Nov. 9. 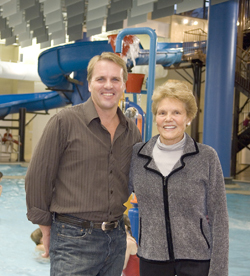 Sun Valley resident Glenn Janss and her son, Brant Cooper, take a few minutes during the event to reflect on the new amenities available at the recently opened Y. The Y?s aquatics center is named for Janss? late husband, former Sun Valley Resort owner Bill Janss. She raised $2 million for the project. Hailey man murdered ?execution style? Get together at ?edge of the world? Early music will accompany ?Stories From the Edge? High costs of our military ?cannon fodder? Anyone sick and tired yet?